The Soudavar Memorial Foundation’s scholarships are highly competitive and awarded on merit to students who possess outstanding academic credentials and demonstrate exceptional leadership potential. We take great pride in their achievements past and present as they continue to enrich our understanding and knowledge of the Iranian World at prestigious institutions across the globe. Nadia Bargneyssi was awarded a scholarship for a PhD at the University of Göttingen in 2004. Her thesis, Abbasid Administrative Terminology in Iran, aims to produce a Lexicon of Abbasid Chancellery and administrative terminology with particular reference to Iran and with comprehensive references to the sources, supervised by Professor Philip G. Kreyenbroek, Professor and Director of Iranian Studies. In August 2015 the Soudavar Memorial Foundation made a grant to Amir Ardalan Emami for a PhD degree in the history of Zoroastrianism at Leiden University’s Centre for the Study of Religion. His application was recommended by Professor Albert de Jong, his supervisor, for research work on his thesis entitled “Transformations in Ancient Iranian Religion: the Achaemenids as agents of long-term change.” Amir Ardalan Emami was recommended for a sabbatical in 2017-18 as a visiting fellow at the department for the study of religion at Aarhus University in Denmark, a prominent hub for researches in cognitive and evolutionary approaches in the study of religion. His contribution there falls within the framework of a long-term project to write a new history of religion gained based on recent research and insight. Shervin Farridnejad was awarded a scholarship for a PhD at the University of Göttingen from 2008-13. His thesis, The Language of Images: A Study on Iconographic Exegesis of the Anthropomorphic Divine Images in Zoroastrianism (Eine ikonographisch/ikonologische Studie zu zoroastrischen Aspekten der sasanidischen Kunst) was supervised by Professor Philip G. Kreyenbroek, Professor and Director of Iranian Studies. In 2014, Dr Farridnejad was appointed as a Lecturer of Iranian Studies at the University of Göttingen, Germany. 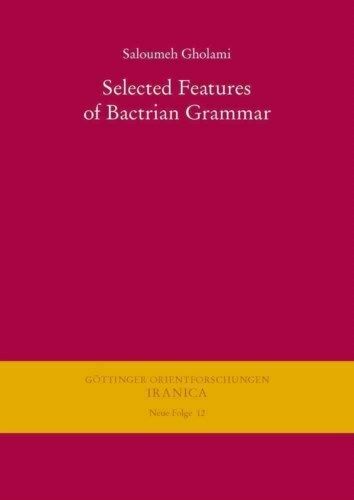 Saloumeh Gholami was awarded a scholarship for a PhD in Iranian Studies at the Goethe-Universitaet in Frankfurt from 2010-12 for a thesis on the position of Bactrian among Indo-Iranian languages; entitled Selected Features of Bactrian Grammar, It was published in 2014 by Harassowitz Verlag, Wiesbaden, within the series Göttinger Orientforschungen IRANICA. In 2013, Dr Gholami was appointed a Lecturer at the Institute of Comparative Linguistics, Goethe University, Germany. The theme of the Symposium allows for rich and concentrated dialogues to take place among scholars coming from different disciplinary backgrounds. Authors of abstracts are encouraged to develop their own specific entry points into addressing the theme of the symposium. Shahrokh Raei was awarded a scholarship for a PhD at the University of Göttingen from 2003-07. His thesis, The End of Time and the Apocalypse in Zoroastrian Texts together with a translation of the Jamaspnamag, has considerably improved understanding of Zoroastrian and comparative eschatology. In 2009, Dr Raei was appointed Assistant Professor of Iranian Studies at the University of Göttingen, Germany. A scholarship awarded to Esther Ravalde enabled her to complete her Master’s thesis, Shams al-Din Juvayni in the Light of New Evidence from the ‘Safinia-ye Tabriz: Patronage and the Role of the Vizier in the Ilkhanate’, at SOAS, which is due to be published in a forthcoming volume by Brill entitled ‘The Mongols and the Transformation of the Middle East’, edited by Charles Melville and Bruno De Nicola. Yusef Saadat was awarded a scholarship for a PhD in Ancient Iranian Culture and Languages at Freie Universität Berlin. His thesis, A Semantic Scrutiny of Selected Middle Persian Words Compared with their Usage in New Persian Texts explored semantic aspects of Middle Persian words and was supervised by Professor Desmond Durkin-Meisterernst, now Honorary Professor of the Institute of Iranian Studies at Berlin. Zahra Talaee was awarded a scholarship for a PhD. For her thesis, The Religious Function of the Endowment Institute of Astan-e Quds Razawi in the Safavid period (1501 – 1736 AD), based on Job Documents, she is perusing sixty thousand unrevealed manuscripts in the Astan-e Quds to understand why the Shrine of Mashhad was chosen by the shah as the place for the promulgation of Shi’ism and the political methods used to achieve this. Alireza Zahedi-Moghadam was awarded a scholarship for a PhD in Iranian Studies at the University of Göttingen in 2009. His thesis, Idols, Images of God’s World: Polytheism and Monotheism in the Ancient World (Die Eschatologie der Ahl-e Haqq: eine Analyse der Quellen), is supervised by Professor Philip G. Kreyenbroek, Professor and Director of Iranian Studies. A partial scholarship was awarded to Bahram Assadian, for work on his PhD in the Department of Philosophy at Birkbeck, University of London. His thesis, entitled Displacing Numbers: On the Metaphysics of Mathematical Structuralism, investigates the nature and identity of numbers and other mathematical objects while also resuscitating Persian and especially Avicenna’s ‘discoveries on the logic of necessity’. By dealing with the philosophical challenges of numbers, this research also resuscitates Persian and especially Avicenna’s ‘discoveries on the logic of necessity’. Through its contribution to the philosophy of mathematics as understood by Ibn-e Sina (Avicenna), it sheds light on unduly neglected aspects of the Avicennian conception of the subject matter of mathematics and explains his account of mathematical objects and theories in structuralist settings. Zahir Bhaloo was awarded a scholarship in the final year of his doctorate at the University of Oxford to complete his thesis, The Qajar Jurist and his Ruling: A Study of Judicial Practice in Nineteenth-Century Iran under the supervision of Professor Edmund Herzig, the Masoumeh and Fereydoon Soudavar Professor of Persian Studies. Arash Emadinia was supported throughout the preparation of his doctoral thesis at Goettingen University under the supervision of Professor Kreyenbroek. His thesis, titled The Soul in the Afterlife: Individual Eschatological Beliefs in Zoroastrianism, Mandaeism and Islam, was presented and accepted in November 2017. Jaimee Comstock-Skipp was awarded a partial scholarship towards her Masters degree at the Courtauld Institute of Art, University of London, starting autumn 2014. She completed a second MA program in spring 2015 in a special program on Mongol through Safavid Persian book arts under Sussan Babaie. She received highest marks, obtaining a ‘Distinction’ on her MA dissertation entitled, Heroes of Legend, Heroes of History: Militant Manuscripts of the Shaybanid Uzbeks in Transoxiana. This June, with funds from the British Institute of Persian Studies, she spent the entire month in Iran touring the region and its museums and monuments. In August, Jaimee departed for Tajikistan to carry out research funded by the Fulbright Program. This will be her fifth sojourn in Tajikistan where she will reside for a year in Dushanbe and Panjikent,. Intrigued by the cultural, artistic, and literary connections across the Persian eocumene with regards to the Shahnama epic, a text that straddles Iran and Turan, along with history and legend, her project will investigate Tajik heritage and cultural identity in relation to the Shahnama and other poetic works, hoping to uncover how Tajiks make sense of their heritage through their own interpretations of the tales and material culture in their museums. Mehrbod Khanizadeh was awarded a contribution towards his PhD at the School of Oriental and African Studies (SOAS), University of London. His thesis, The Pahlavi Version of Yasna 9.1-15 was supervised by Professor Almut Hintze, the Zartoshty Brothers Professor of Zoroastrianism. Pedram Khosronejad completed his PhD in 2007. He was awarded a scholarship for the final year of this doctorate at École des Hautes Études en Sciences Sociales (EHESS) to complete his thesis, Les Lions en Pierre Sculptés chez les Bakhtiâri: Description et Significations de Sculptures Zoomorphes dans une Société Tribale du Sud-ouest de l’Iran (Stone Lion Sculptures among the Bakhtiari: Descriptions and Meanings of Zoomorphoric Sculptures in a Tribal Society of South-western Iran), supervised by Professor Thierry Zarcone, Research Director of CNRS. The beginnings of Islamic ceramics have long been attributed to the opaque white glazed wares made in Iraq in the 9th century in response to the imported Chinese porcelain and stoneware. These Islamic glazes were known to have been opacified by tin-oxide and much work has been undertaken to characterise their development and spread. However, little has been done to explain the origins of this technology and its invention in Iraq. This thesis takes a new approach to investigating the beginnings of Islamic glazed pottery. It examines the technical aspects of early Islamic glazed wares from the 7th to 10th century AD from the Eastern Mediterranean to Central Asia. A significant number of sherds from Fustat, Aqaba, Al-Mina, Raqqa, Samarra, Basra, Kish, Susa, Nishapur, Merv and Samarqand were sampled and analysed using a scanning electron microscope equipped with energy dispersive spectroscopy (SEM-EDS). Particular focus was placed on the opaque yellow glazes from the Eastern Mediterranean and Mesopotamia (7th-9th century) and the opaque white glazes from Mesopotamia and Central Asia (9th -10th century). The analyses showed that the opaque yellow glazes and the opaque white glazes were respectively the result of lead-tin-oxide particles in high lead glazes, and tin-oxide particles in lead-alkali and alkali-lead glazes. Using experimental replication, it was found that at temperatures around 900°C, and in the presence of alkalis and alkaline earths, lead-tin-oxide particles convert to tin-oxide and that the colour of the glaze changes from yellow to white. It was therefore argued that the opaque yellow glazed wares of the 7th/8th-century Eastern Mediterranean represent a precursor to the opaque white glazed wares that flourished in Iraq in the 9th century. The results have helped change the way the beginnings of Islamic ceramics are viewed: origins in the 7th/8th century AD rather than the 9th century AD, first developed in Egypt or the Levant rather than Iraq, and indigenous rather than Chinese-inspired. The eastward spread of Islamic glazed wares to Iraq in the 9th century follows the move of the Islamic capital from Damascus, Syria, to Baghdad, Iraq, and the further spread of this technology east and west can now be traced. Mahsa Mohajer is undertaking a PhD in the Department of Landscape Architecture at the University of Sheffield, supervised by Dr Ross Cameron, Senior Lecturer in Landscape Management, Ecology and Design. Her research aims to develop new approaches for designed urban plant communities to meet ecological and sustainability needs, which will significantly improve the efficiency of water use in Iran’s urban landscape. Narges Nematollahi was awarded a scholarship for her PhD started at SOAS under the supervision of Almut Hintze, Zartoshty Brothers Professor of Zoroastrianism. Her research project, entitled ‘The Avesta and Pahlavi Versions of the Hymns to Sraosha’ is aimed at creating a critical text edition based on the manuscripts of the Avesta and Pahlavi versions of Yasna 56, 57 and Yasht 11, with commentary, translation and dictionary. Narges is now at the University of Indiana Bloomington, where she was invited to continue her PhD. A partial grant was awarded to Janet O’Brien for her PhD on Persian art at the Courtauld Institute of Art, London, under the supervision of Professor Sussan Babaie, for 2017-2018, and will be extended for another year. Under the title, Embodying Kingship: Emergence of Persian Royal Portraiture (1739-1794), her research topic focuses on the evolution of post-Safavid royal portraiture. A one year grant was awarded to Adeela Qureishi for the completion of her thesis on the Mughal Qamaragah (hunting enclosures) as represented in Iran. Shahrokh Razmjou was awarded a scholarship for two years of his PhD from 2007-08, which he had begun at the École des Hautes Études en Sciences Sociales (EHESS) and completed at Birkbeck College, University of London supervised by Dr John Curtis, Director of the Department of the Middle East at the British Museum. Dr Razmjou’s thesis, Ritual Practices at Persepolis, was awarded the Foundation of Iranian Studies’ Dissertation Prize in 2008. Razmjou was previously Director of the Centre for Achaemenid Studies at the National Museum of Iran, a Clore Leadership Fellow in 2007, appointed curator of Ancient Iran in the Department of the Middle East at the British Museum (2009-2012), and is currently teaching at the Department of Archaeology, University of Tehran. Arash Zeini was awarded a scholarship for his first year at SOAS as a PhD student in 2008-09. His thesis, entitled The Pahlavi Version of the Yasna Haptanghāiti, was completed in 2013 and supervised by Professor Almut Hintze, the Zartoshty Brothers Professor of Zoroastrianism.